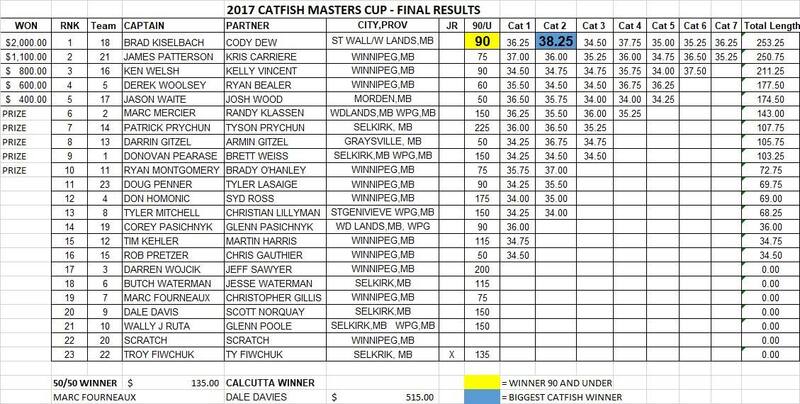 The 2017 Catfish Masters Cup has come and gone and so has passed my first taste of competitive angling. We had planned to enter the inaugural year, but circumstances didn't allow for it and we were determined that wouldn't be the case for the second year. The tournament is a one day, two person team, catch, measure, photo and release format with each catfish over 34 inches qualifying with a 10 fish total, running from 8 AM to 4 PM. Measurement and action shots of each qualifying fish get sent by text to the organizer and a confirmation is then received via text. We did some pre-fishing the day before the tournament (cut off time 4 pm) and it was awful! 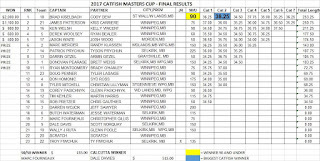 After over 16 spots tried and soaking a multitude of different baits we were able to land two catfish over 34 inches. Water levels were low, temperatures high and there was minimal surface activity. Our confidence and outlook for the next day took a serious hit. With the Red River a two hour drive from home we don't fish it as much as many who entered, but when we do fish it, we are usually rewarded with good numbers and ample trophies, sadly this was not the case. 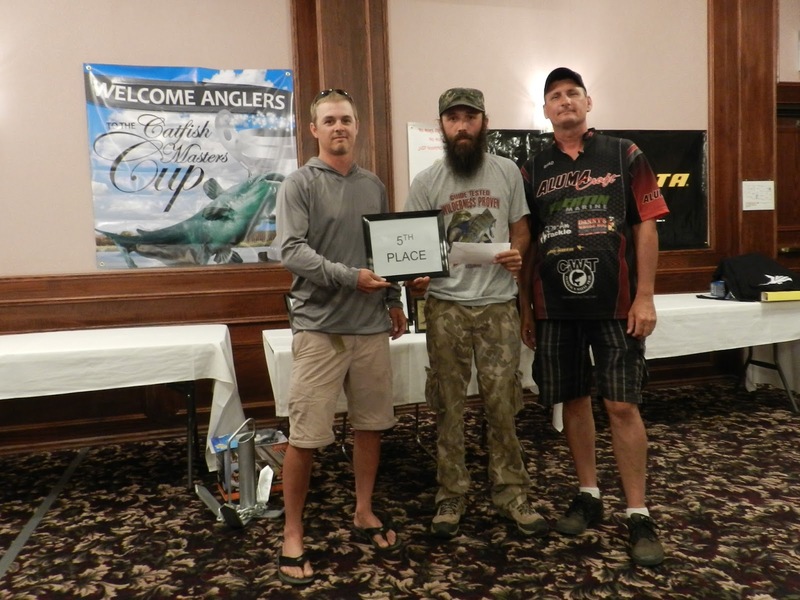 After the rules meeting it was clear the bite was going to be tough and through conversation with other anglers and looking around at the many clad in fishing jerseys and guide shirts, the competition was starting to look fierce. Saturday was a new day and my partner and I both went in to it as positively as we could. With a revamped strategy and lots of spots in mind, we were going to give it our best effort and not give up. Plenty of bait, ice, fluids and snacks were packed in two coolers, as the weather forecast was calling for a high of 34C. Boats were launched and inspected and slowly one by one the stretch of river around the docks at Selkirk park was filling up. Anticipation was building as we tied some back up rigs waiting for the 8 am trickle start. As the minutes counted and the trickle start began we waited for #17 and off we went heading south bouncing over a dozen other boats wakes. We worked the shallows, main channel, drop offs, holes, flats, bends, pockets, you name it we tried it, moving every 15 minutes or so if we wouldn't get a bite. As each hour passed without a bite, the days outlook was looking worse. Out of all the boats fishing within sight, only one of them had caught two fish. After about our tenth move Jay missed a bite within five minutes of tossing out his bait. This was more than we could say for the previous 3.5 hours and things were possibly starting to look up. Over the next 100 minutes we were able to bring over 10 catfish to the boat with 5 of them qualifying. All our work and effort was finally starting to pay off! 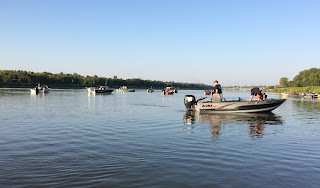 Our morale was suddenly sky high and the roller coaster ride that is tournament fishing was providing more excitement and emotion than we had bargained for. The bite scaled back for our last 90 minutes of fishing with a handful missed and sadly a couple fish were also able to spit or shake the hook, which rarely happens when we fish for cats. With enough time to make it to the launch for cut off we were on our way, but it was a moral victory not heading back with a big zero. After chatting with some of the teams while loading and packing up the boat, it became clear that it was tough all around. Some boats came back with none landed over 34 inches and others with one or two, we also heard of at least two teams that did better than us. At the awards banquet it became clear we were in the money and after 6th through 10th were awarded, fifth to first were called and fifth was where we stood. 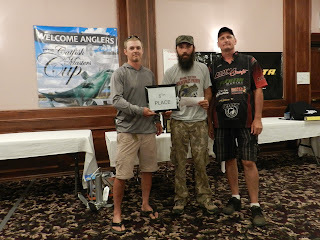 1st through 3rd were all guides for the same business that spend hundreds of hours on the river each season and with the kind of bite that seemed to be going on and the caliber of competition, we were definitely happy with our finish. The what ifs? and emotions of tournament fishing are many and what's done is done and in the books. The tourney for sure has room for improvements and maybe with a few volunteers and more sponsors it can grow and even entice anglers from further away. 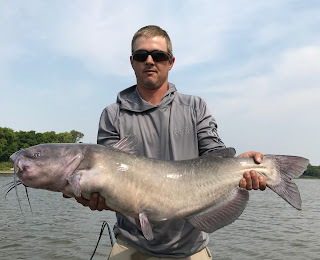 (I sure hope so) I would encourage folks who think they know the red river and love hammering catfish to give this one a chance. Would I do it over again? Hell Yea! Will we sign up for next year? I sure hope so! I would also like to thank Red Bull as it gave our captain wings.